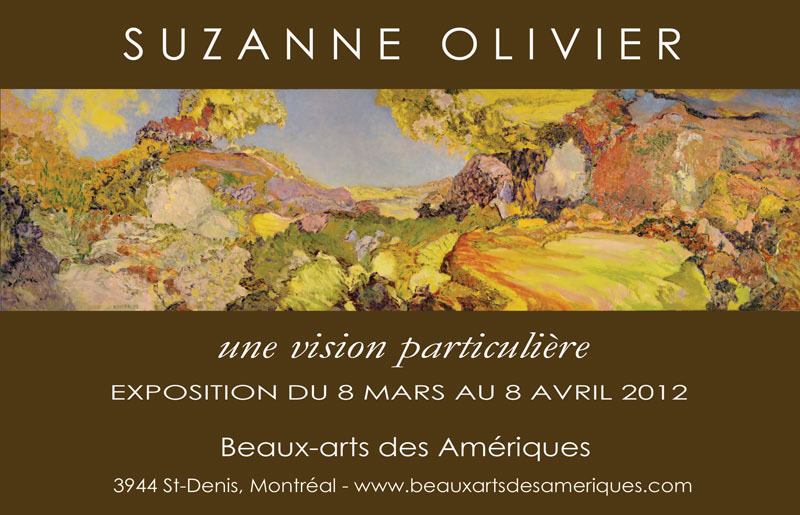 The work presented here are the result of an uninterrupted exploration which began some forty years ago, when already fascinated by the beauty and mystery of nature, Suzanne Olivier categorically distanced herself from the subject in order to represent the metaphysical ties that connect her to the earth. From a figurative representation of nature, she advanced to a purely abstract expression of the four elements, both the mineral and vegetal, and composed her imaginary landscape in a unique pictorial language. We are invited to “go beyond appearances” and to surrender ourselves, little by little, to these uncharted concepts and be irresistibly drawn to this brilliant approach. Water, air, fire, the kingdom of plants and inorganic matter are Suzanne Olivier’s subjects. And kingdom it is this princely place, where nature reigns in all her beauty, her power, her timelessness, her indifference. A world without creatures but which engages them. A paradise lost? No, it is always right there, beyond our turpitude. We are of this work – the audience – who see, who follow this free expression, this path of Suzanne Olivier’s. The artist points out that we are out of step, distracted by the fashionable and trendy, and that the real and troubled world resonates perfectly with a thoroughly contemporary concern. Beyond their intrinsic beauty, the paintings bring us back to the tangible reality of our environment. The term “visual poetry,” which has already been used to describe the work of Suzanne Olivier, is totally suitable. Visual poetry where the stanzas, the rhymes, the lines, the volumes, the colors define the drawing. She surprises and enchants us at every turn, because her method is different in every way and can never get enough of exploring this garden of a world. These sensual paintings are bewitching. They continue to suggest interpretations and to reveal an infinite number of meanings at each glance. Is this not the mark of a strong work, to give a sense of something new at every turn? Suzanne, I have just spent the last 20 minutes trying to think of how to express my feelings about your latest works without sounding foolish. The least I can say is they move me in a very good way. When I look at them I feel as though I have been there, not actually there but my mind puts together a compilation of memories of places, sounds , light, colour and emotion. Not a singular experience, but a bringing together of many moments and places which all come together to create a new abstract view of the something I have experienced. The work of Suzanne Olivier is visual poetry – impossible to justly describe with mere words. Neither figurative nor abstract, her paintings excite the imagination taking us on a trip to places where the landscape shifts and transforms before our eyes. Everything in this unrivalled and unparalleled environment is unique, original. Art has the power to trigger differing emotional responses in viewers. One part of Olivier’s talent rests in this power and in the ability of her work to move the viewer to a state of transcendent spiritual experience at first sight. It is as if the subconscious self has understood the image playing out on the canvas before the intellect can define and claim it. On closer inspection the viewer studies the draftsmanship and colour choices, delighting in the diversity of shades, richness of textures and beauty of the patterns before arriving at the “Eureka!” moment when elements which resemble no conscious litany transform themselves before the eye. Is it a sky or a sea, a lake or a mountain; and every answer is correct. Mysteriously, all takes shape; comes to life. We find ourselves fixed, changed and uplifted by the magnificence of a living work representing a pure imaginary countryside. Many of the paintings showcased here were conceived during the tragic time surrounding the Japanese tsunami that occurred in the winter of 2010. I sometimes feel I paint the end of time, the end of humanity. middle ground, and background. This and several other artistic choices that Olivier makes may surprise us. However, by forfeiting the linear perspective which the Renaissance introduced she ultimately reappropriates the picture plane’s evenness. Do Olivier’s paintings reflect the solidity of matter? Look carefully. The clouds gathering above change into stone while mountains morph into clouds and entire mountainsides cavalcade down the slopes like billows of mist or pink snow. To all intents and purposes everything solid becomes liquid, thus allowing us to peer into the impenetrable. Meantime, blurred foregrounds undermine any “realist” interpretation of these works which also defy perspective, and therefore prove what I previously stated in this regard. Yet where necessary the artist creates a sense of depth through the use of mauve. Olivier’s canvases exhibit a strikingly protean quality because of the metamorphoses they constantly engender, whether from solid to vaporous, cloud to mountain, or rock to precious gem. They say that “art imitates nature,” but forget to add, “in its workings.” Rising out of the shadowy haze the mountains retain their deep ruby sheen, while in the foreground boulders go every which way, moving at will towards or away from us. Olivier arrays a wealth of colours: orange, crimson, yellow, and violet. We find ourselves in a land whose rocks consist of pink, baby blue, magenta, and pale green gems…Words fail us to describe these truly wonderful colours from another world. Take for example Olivier’s 2010 painting, Le temps d’une rupture. Here a fiery sky, like those of Edwin Church, broods over a golden river that flows to the right, carrying in its wake molten lava straight from the earth’s bowels. How did we get to this place? The artist created “a breach in time” which permits us to glimpse a world more beautiful than ours…but without longing for a paradise lost. In sum, Olivier unveils the landscapes that lie within us. François-Marc Gagnon, writer and art historian. When I was a child, my days, from sunrise to sunset and beyond, were consumed with a primal and passionate yearning to explore every forest, meadow and shoreline and discover that elusive trail that would lead me to the worlds of my imagination that I knew with the tingling certainty of innocence, lie just beyond and within my grasp. Now, I am much older and fate woven wiser. 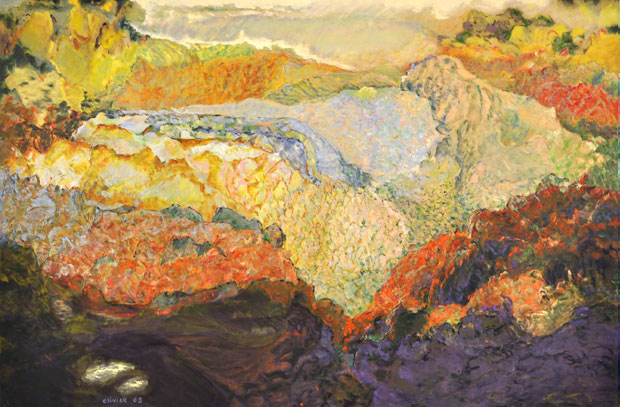 But when I gaze into the worlds of Suzanne Olivier’s paintings, I am once again that wildly courageous and unfettered child, trembling with victorious delight, that the trail that had eluded me for so long, is finally found. And so I stand, with twig in hand, deciding on which path to the horizon, I’ll follow first. In Pris aux pièges de la terre, there is a limitless depth of interpretation for the seer and this rare and elusive insignia of artistic maturity has evolved directly through your following the guidance of instinct as one who creates. And like all great artistry whether literature, music, poetry or painting, this element of depth arises through the manipulation of the phenomenal of your landscape to beyond the expected, beyond the recognizable and beyond the safely familiar and provides, at the very least, modern precedence to a very old and respected art form and firmly establishes standards (yours) to which future generations of artists can and will aspire. In Pris aux pièges de la terre, there is life and light and answers bursting from the dark and the bold. Nature is an indomitable character that always wins in your paintings. And in such spiritually bleak times such as ours in which humanity trembles without a saviour in the face of environmental ruination, I love and appreciate, with primal exhilaration and reverential humility, this message of optimism that there remains forces far greater than us. You have tapped into the oldest and newest of the world’s religions, nature. Like all true artists, you see light years ahead of the rest of us. I would like to pay tribute to Marc Boisvert, Sculptor, my companion from 1961 to 1965, during my years at the École des Beaux-arts in Montreal. Many years later, in certain works from this period, I find his undeniable influence in my use of welded iron in sculpture and bands of colour in my paintings. I had forgotten all this for such a long time. We each continued our artistic path apart. His, unfortunately, ended in 1985. I continue. In March 2010, a retrospective of Marc’s work was organized by his daughter, Valérie, with the collaboration of the Musée des Beaux-arts in Sherbrooke. HIM: A chance click auspiciously re-opened an earlier e-mail which had somehow escaped my full attention. I’ve been rewarded with a careful, second reading and would like to offer this second, more attentive, response. I sense your powerful desire for some radical departure from your present doldrums. You seek the means to reassess, to renew, to recharge. That profound measure of contentment you achieve in your studio may buttress daily life but, nevertheless, should either the spirit or the imagination falter, you must learn to accept the consequent ‘sightlessness.’ Experience has shown that creativity will, one day, joyfully return. This knowledge should provide an elemental serenity, a confidence that can contemplate the blind fumbling of today as compost for tomorrow’s unexpected treasures. ME: Yes, things seem to have come full circle with extraordinary, unexpected vigour. Never have I painted with such facility, so sure a sense of the ‘rightness’ of my goal. If I can fruitfully continue my trajectory this body of work will delineate my art. I speak of this motivation as if it exists outside myself – almost an exterior vehicle – with neither embarrassment nor arrogance. This is because I believe that chance alone has nourished my artistic development and fueled my perseverance. And my joy in creating art is linked to a personal measure of responsibility and a sense of abiding privilege. HIM: Surely these moments of ‘sightlessness’ prefigure bursts of prodigious output. ME: Without question my dark days of inactivity are emotionally very tough. I want to shriek frustration at all and sundry when, sightless in Gaza, I see no end to my agonies of indecision. Or, I magically redirect this distemper to springboard me further than I have ever travelled before. Images begin to coalesce; subtleties assume definition and harmony as my brushwork outpaces thought. Later, when I revisit this work, my heart delights. HIM: Rudolf Steiner contends that man’s role is to invest matter with spirituality and I always add that, conversely, this same spirit may itself be ‘materialized.’ In your case this implies the paraphernalia of paint . . . I feel the purpose of life lies in those ongoing revelations of the past, the present and the future which intuit the kaleidoscope of infinite dimensions which both envelops and informs our existence. From time to time a momentary crisis sends illusory signals of Armageddon. To know one can re-learn that which is temporarily storm-lost is the seed of wisdom. We are far, far more than the known sum of our parts; and life consists of exploring this very fact. I was surprised that the paint was thin, for some reason the lushness of the color on the computer screen led me to believe you painted thick. Now I see how you draw with line and mass. And what nice drawing. You are doing something very amazing with the tones, muted, yet stunning warmth. How you manage sky and field to come out of the same mix. They are really beautiful – and your composition is solid in both 2 and 3 dimensions, it “works” as a flat composition as well as giving the illusion of a huge space. it is because, in the painting she chose for me, I find extraordinary complementary and exceptional qualities, to the point that, from the very first glance, this work won me over completely. 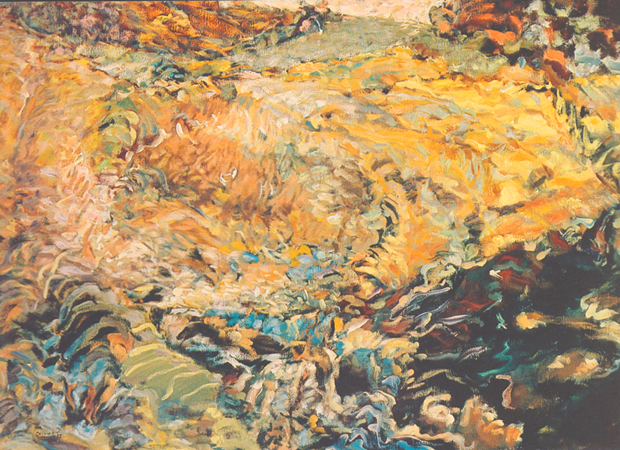 But on looking a little closer, this delightful “confusion” reveals something more, a landscape emerges. A landscape of a lost paradise which, with its ochres, blues and silver greys, could be somewhere in Provence, not on the coast but further inland. The shapes take form in our memory, our imagination. A transformation occurs between what we think we see and what is real. Magic is at play.